At Tailor Made Servers, we consider our network to be of vital importance. Our customers deserve the best there is, period. That is why our premium network offers low latency, high throughput, redundancy, uptime and the reliability you would come to expect from a Top Tier provider. With our hub in Dallas, TX, our network performs at swift speeds, reaching your customers efficiently regardless of their location. Guaranteed by our SLA for 99.99% uptime our network will get you as close to the cloud as you can be. This is done thanks to multiple Gigabit links to various carriers, as well as Internap's Flow Control Platform (FCP). While BGP offers the redundancy necessary for a multi-homed network, the FCP appliance takes this one step further. The FCP is designed to identify the fastest routes for your data based on performance. 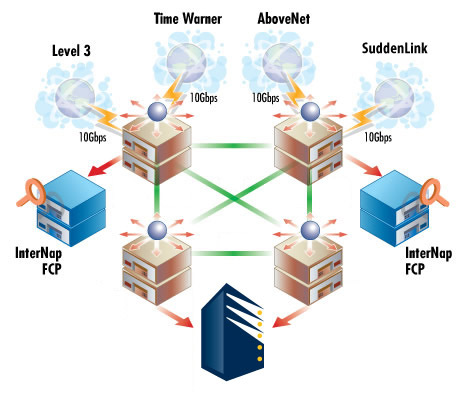 In the event of increased latency or packet loss, it will reroute your data through a more efficient path. That is smart routing. Last but not least, all of our servers come standard with 100Mbps ports. This allows you to burst freely at any time and get rid of worries or slowness. Users connecting to your servers will thank you for having great connectivity to virtually anywhere in the world.